Last week, my nephew, Thomas, came to stay during his school holidays. He had just turned 15, and this was his first holiday without his parents. It was also his first time on an aeroplane, so you can imagine how excited he was! His elder brother had come to visit two years ago, and we had had a week of outings and visits to keep him happy and amused. I was wondering what would keep Thomas happy, and when I asked if there was anything he really wanted to do, his reply was: “I would like to go to the beach”. 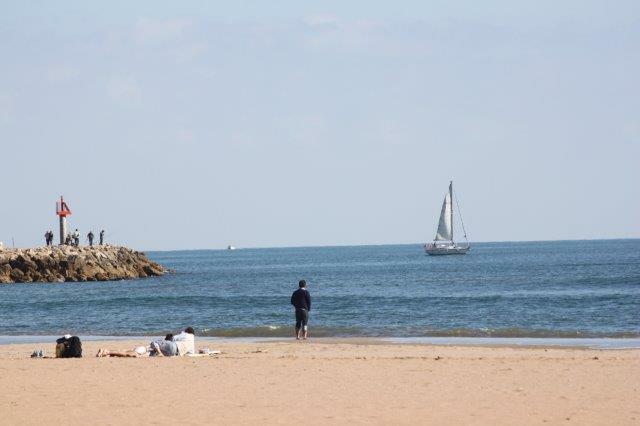 He arrived on Wednesday, and as Thursday was a beautifully sunny day we went to Valras Plage in the afternoon. The restaurant is called La Paillote Nomada. 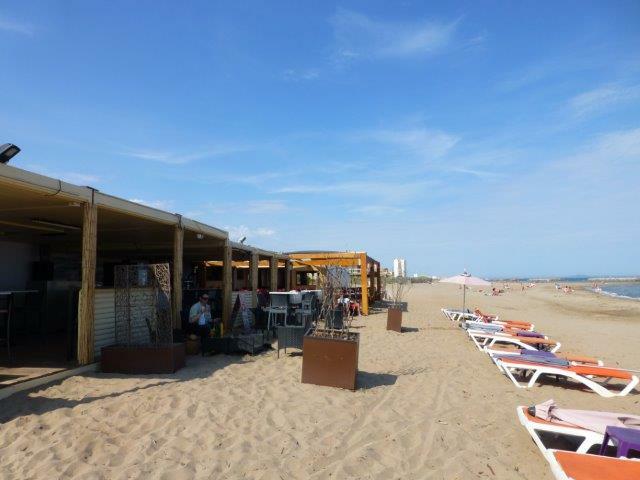 Paillotte means a straw covered hut, and refers to the temporary nature of the beach restaurants, which are usually dismantled over the winter months – there are several such restaurants along the beach in Valras Plage. Thomas quickly changed into his swimming things and after a cursory rubbing on of suntan lotion he was off into the water and the waves. There was a bit of a breeze, and I was glad to have brought a light jumper, sitting as I was in the shade. The water was barely 15 degrees, but Thomas was having the time of his life, swimming, diving through the waves and paddling! I had a job to persuade him to take a break, but he did come out of the water and I treated him to a nutella filled crepe. No sooner had he finished it, than he was off into the water again. The beach was fairly empty, so he had it pretty much all to himself. 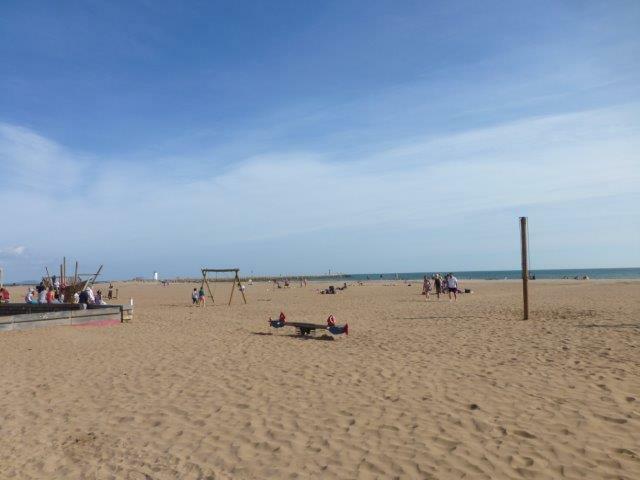 On the Sunday we went to the beach again – this time to Narbonne Plage. I had seen an advert for a kite festival there, and I wanted to see what it was all about. 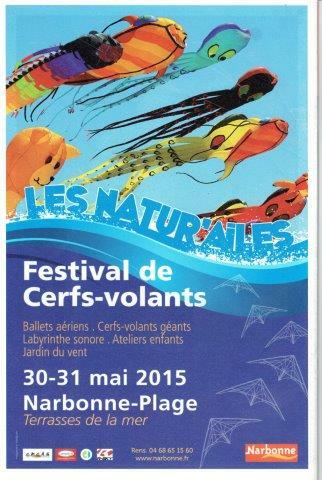 We could see the kites as we drove down the hill into Narbonne Plage. It looked very exciting! Where Valras Plage had been almost deserted on Thursday, Narbonne Plage was positively heaving with people on that Sunday . 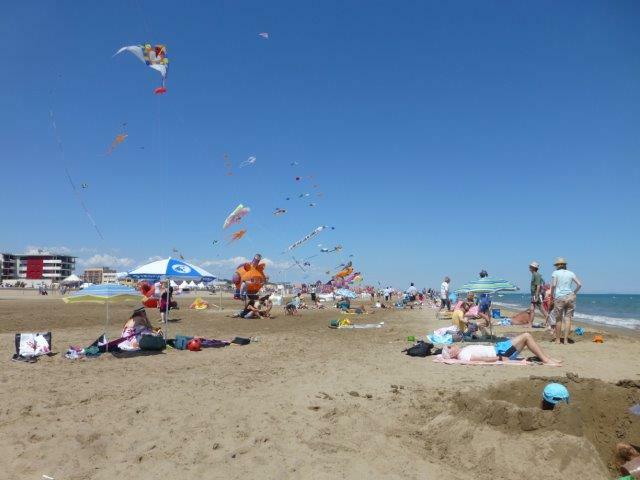 A huge area had been cordoned off on the beach, and within that area a large number of kites were anchored. A lot of the kites were carrying other inflatables – there were all kinds of fun shapes floating around. Can you see the black witches in the picture above? On the other side of this area, an arena had been set up. This arena was used for demonstrations of kite flying, and they were doing some amazing stuff there!! I tried to take a video, but could not catch the kites, they were just too fast! A number of stalls had been set up next to the arena, selling all kinds of merchandise related to the festival. 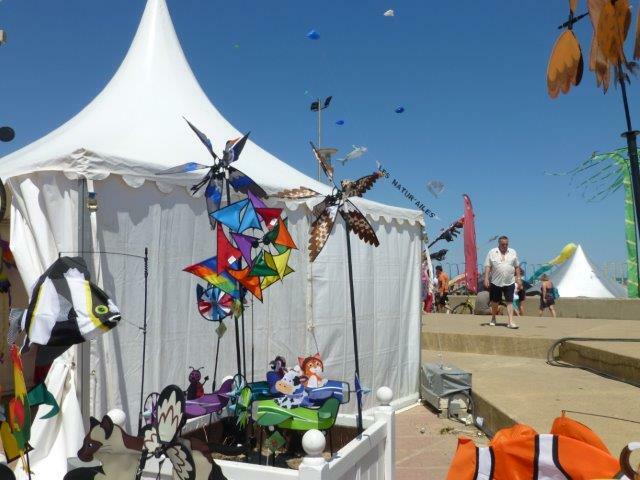 I was very taken with the windmills on sale at this stall! 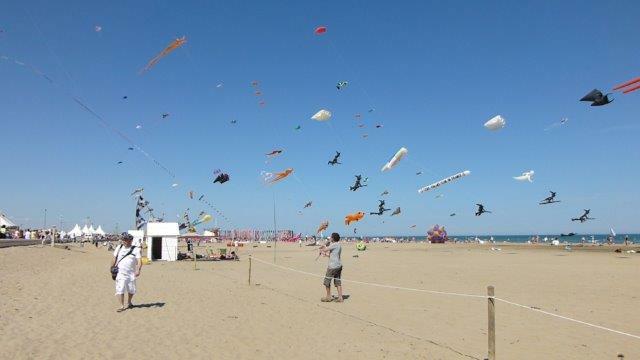 At another stall, I overheard in passing that a competition kite can cost anything between 2,000 and 5,000 Euros!! I was totally floored! Back at our “base camp” on the beach, I watched someone flying one of these expensive kites close-up. The precision and skill were totally impressive! 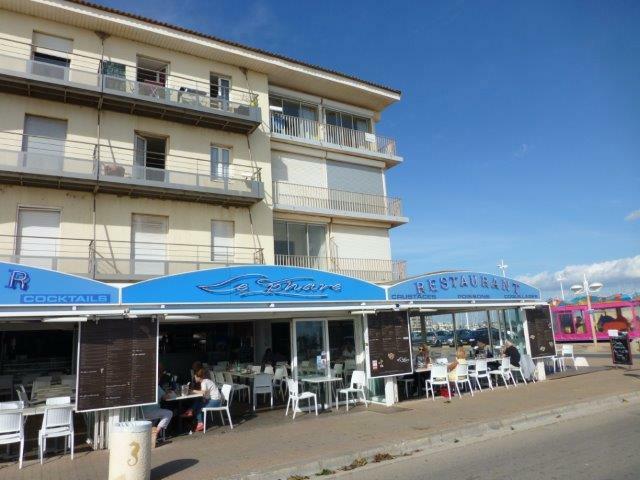 We were back at Valras Plage Monday afternoon – Thomas wanted to take us out to a restaurant in the centre of Valras Plage, L’Auberge Provencale, where he had eaten some wonderful mussels on his last visit with his parents. We went early enough, so that he could have another swim, and went to La Nomada again. This time it was a little warmer, but the waves were not as big as during our previous visit – much to Thomas’s disappointment. Once again, there were very few people on the beach, so it would appear that weekdays are best for going to the beach during the off-season! I promise that I’ll write about my restaurant visits with Thomas in a soon to be published blog! During the late fall and winter there are often days when the sky is a bright blue colour, and when there isn’t a breeze stirring. 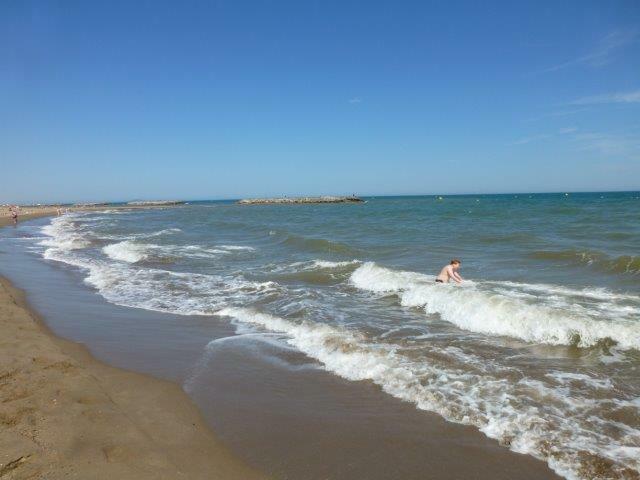 Those days are perfect for a visit to the seaside! In my case the closest seaside means Valras Plage, which is only 30 minutes by car from Saint Chinian, and that’s precisely where I went recently for a spot of lunch. In the off-season, many restaurants and shops are closed in the towns along the coast. But there are still enough cafes and restaurants open to choose from, and on my visit to Valras Plage I went to the aptly named Le Phare (the lighthouse), very close to the port, and to the beacon which marks the entrance to the harbour. Le Phare is under new ownership, but the restaurant and its menu haven’t changed very much since my last visit. 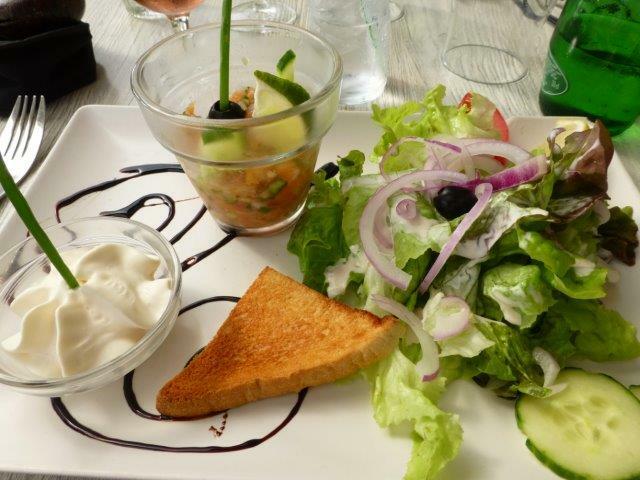 The starter of the day was a tartar of salmon, which was very tasty: chopped raw salmon fillet, mixed with finely chopped cucumber and onion, and seasoned with olive oil and a little lemon and lime juice. There were mussels on the menu, with French fries, of course!! And of course I chose that dish for my main course! 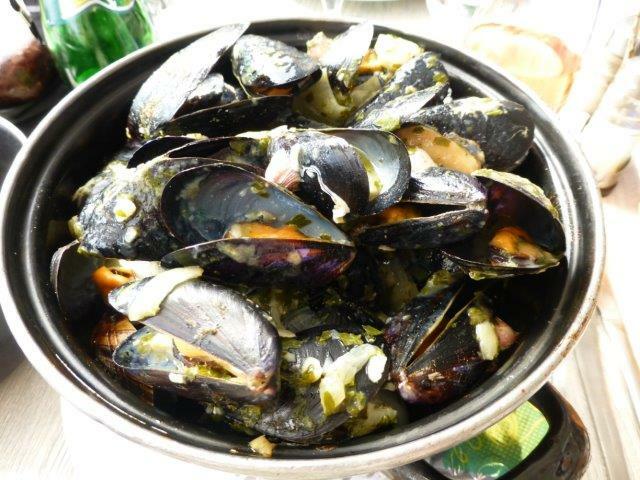 I can never resist eating moules frites by the seaside!! There were some very large, yummy mussels in this pot. Dessert, anyone?? Of course — who could resist!! 🙂 Profiteroles or ice cream?? Ice cream for me, please! After that lovely lunch, a walk around the town was de rigueur. 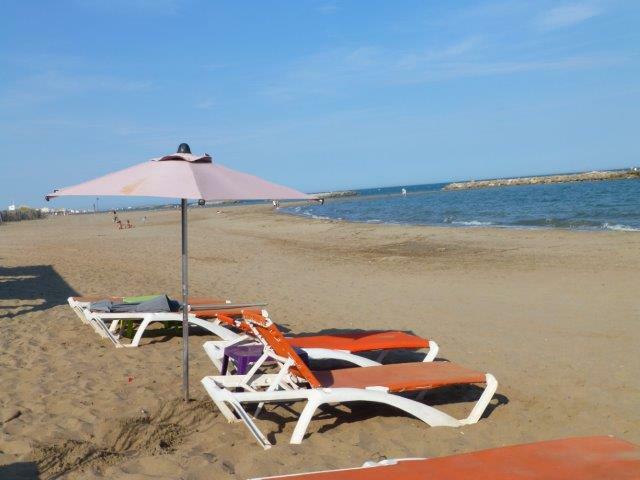 There were a fair few people on the beach; it was warm enough to lie in the sunshine after all! Valras used to be a small village mainly inhabited by fishermen. All that changed with the arrival of a railway line in 1846. People from and around Beziers could afford to travel to the seaside, and when the electric tram arrived in 1901, the village became ever more popular with seaside tourists. Hotels and chalets, and bars and restaurants were built to accommodate the visitors, and the village started to expand along the beach and grew into a town. The yacht harbour was constructed in the early seventies, and today there are moorings for 350 boats, in the harbour and along the Orb river, which flows into the sea at Valras. A walk around the town will allow you to discover many buildings from some of the different epochs of the town. The balcony railings look very art nouveau, and the bazaar could be from the 1930s. Many of the older houses, especially along the seafront, have been replaced by bigger apartment buildings, but none of them are more than five stories tall. So if the seaside is not for you in summer, maybe I can tempt you with a visit out of season? ?